"This is honestly the best salmon you will ever taste! Lemony dill salmon fillets steamed to perfection in tin foil pouches accompanied by homemade tartar sauce! Quick. Simple. Delicious." Place a steamer insert into a saucepan and fill with water to just below the bottom of the steamer. Bring water to a boil. Add potatoes and green beans, cover, and steam until tender, about 10 minutes. Drain. Brush the shiny side of 2 large pieces of aluminum foil with 1 teaspoon olive oil each. Place salmon skin-side down in the center. Brush remaining olive oil and garlic over salmon. Sprinkle dill on top. Divide lemon slices over salmon; squeeze 1/2 lemon on top. Season with 1/2 teaspoon pepper and 1/3 teaspoon salt. Cover salmon with 2 pieces of aluminum foil, shiny-side down. Roll aluminum foil inwards on all sides to create a pouch. Transfer pouches to a baking sheet. Bake in the preheated oven until salmon flakes easily with a fork, 10 to 12 minutes. Mix mayonnaise and capers together in a small bowl to make a tartar sauce. Stir in juice from 1 lemon, 1/2 teaspoon pepper, and 1/4 teaspoon salt. 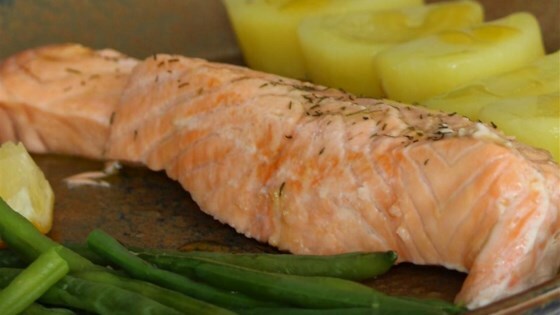 Serve steamed potatoes, green beans, and tartar sauce alongside salmon. Substitute 2 finely chopped dill pickles or 2 1/2 teaspoons green relish for the capers if desired. If using relish, mix in some chopped dill. Easy and delicious, this is a perfect meal. I didn't use the tartar sauce though. The salmon and veggies are so tasty on their own. Thank you for the recipe.